Madagascar Photographer: James Wu Artist Statement: During a remote village expedition to evaluate and support a newly instated environmental curriculum that she helped develop at Center ValBio, Kelly decided to experience traditional Malagasy hair braiding. 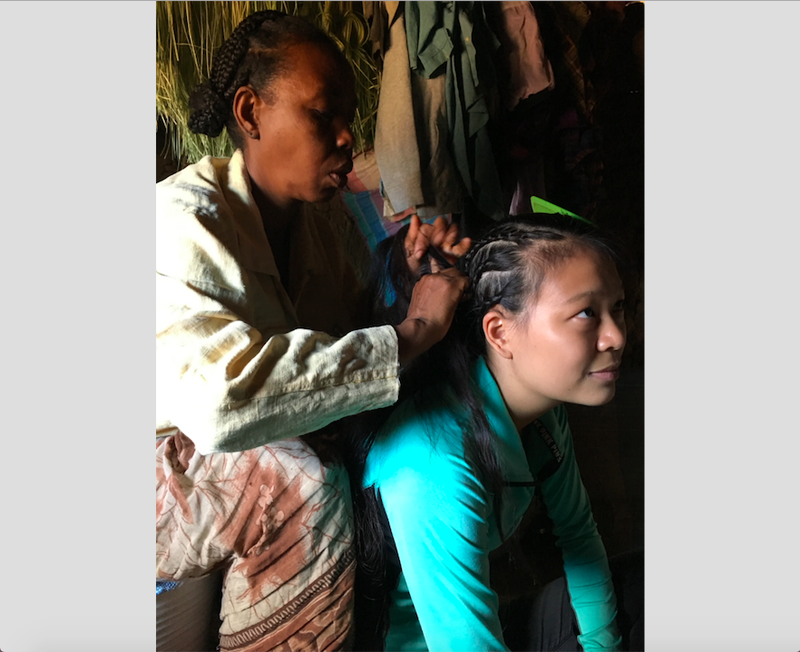 Warmly welcomed into the dim mud hut, she sat on a straw mat as a Malagasy woman known for her neat handiwork transformed Kelly's hair into rows of tight braids. At the campfire that night, the Malagasy education team could not stop talking about Kelly's hair because they had never met a vazha, the Malagasy word for foreigner, who changed her appearance to respect local cultural norms. They deeply appreciated Kelly's consideration and later reflected that this event altered their perception of foreign community volunteers. A recent DukeEngage Magazine feature highlighted an independent project undertaken Madagascar during the summer of 2013 by Cameron Tripp and Sophie Stall.